I love a good tote bag. That’s all I carry my books in — when I moved across country a few years ago, I ended up buying about 50 reusable tote bags from the local grocery store and stored all of my books in them. It was easier to carry and, in my mind, safer than shoving them inside cardboard boxes. The only downside was they were all tote bags which had the grocery store’s name on them. Fortunately, there are tons and tons of awesome tote bags for the bookish. Check out these seven awesome literary tote bags to lug your to-read piles with you either to work or across the world. Carry the book on your bag. Have you seen these awesome bags over at Litographs? This particular one features the text from Franz Kafka’s The Metamorphosis and the image itself is the key element of the story. This is one case where I wouldn’t care my tote bag has a giant insect on it. If Kafka isn’t your style, check out the huge assortment of classic literature featured on their other tote bags. (You can also get these prints on t-shirts and posters, too). Sport a bag that looks like a book cover. Did you know that Penguin sells tote bags that are done in the style of their Penguin Classics covers? Above are the ones for Aldous Huxley’s Music at Night and my personal favorite, the tote for Virginia Woolf’s A Room of One’s Own. Don’t care for either of those? You can check out other options in their store, as well as fun smaller bags, water bottles, notebooks, and more. Tote a bag made from a book. Have a favorite picture book? This etsy shop will make you a tote bag with pages from the book itself. The tote pictured above is from a Winnie the Pooh picture book, and there are a few other in the shop to show you what it looks like (and you can purchase any of those if you want to). What a perfect bag for budding readers, as well as older ones. Make a statement. I’m a fan of the standard canvas bag because sometimes simpler is better. But a plain canvas bag is boring. Fortunately, this awesome etsy shop has all kinds of hand-printed and designed heavy canvas totes that feature quotes from favorite books, as well as statements about being a loud and proud bookish type. I dig this one featuring the famous line from Where the Wild Things Are. Tell others of your bookish devotion. Not only can you buy books to increase your happiness, you can then carry them in a bag dedicated to your own brand of happy. This bag, designed by Joy St. Claire and sold through Society6, is one of the handful of awesome bookish totes you can buy through the company. You can also get bags featuring The Mortal Instruments, The Hunger Games, and Harry Potter. Show more than a little bookstore love. I’d be remiss if I didn’t talk about the tote bags you can pick up at book stores or libraries, which go to further support our passion. I’m a huge fan of the bags that The Strand has, and this bag, called “falling books,” is easily my favorite. But you can choose from tons of different designs and styles, some of which feature bookish themes and some of which don’t but still show off your love for the bookstore itself. And if a tote bag is a little too small for your needs, you can size up into a bigger bag. I’m partial to this one and this one. Declare your love for all things literary and nerdtastic. If you don’t already know Out of Print, then get to their website post haste. 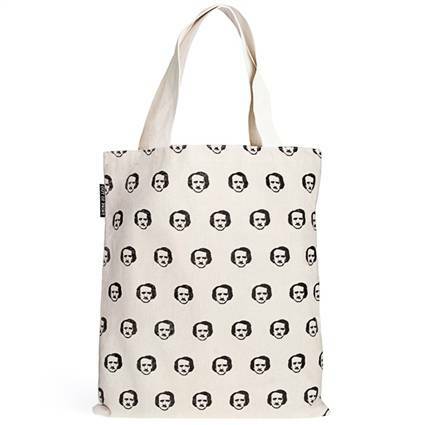 This bag above is called Poe-ka Dots because it features my main man Edgar Allan Poe. As a polka dot. Get it? If Poe isn’t your bag (I know, I know), they have so many other fun bags to check out. I love the banned books tote, the Alice in Wonderland tote, the tote featuring The Very Hungry Caterpillar, and, well, let’s say I have a huge wish list of totes (and other bookish goodies) from this site.